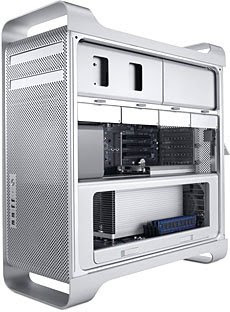 Intel’s latest generation architecture comes to the Mac in the new Mac Pro. It has the Nehalem Xeons which is like 2x the speed of the previous series. It’s really a single-die, 64-bit processor with all the power you could want of many cored CPU’s. It uses 1066 DDR3 Ram and Turbo Boost which gives it more power on full load! These are the fastest Macs that you can spend your money on. It’s a 2.66 Quad and 8-Core 2.26 options to choose from and you really won’t regret either. Wow! $2500.